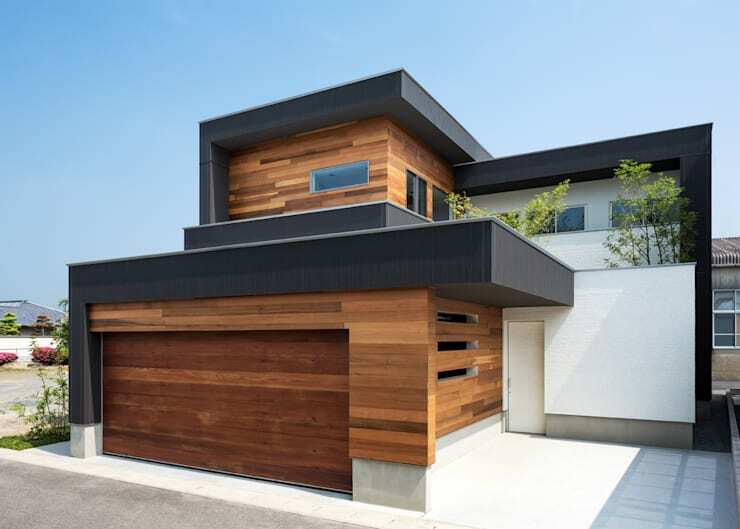 This gorgeous abode, the brainchild of creatives at Japan's Architect Show Co., beautifully combines a range of materials and finishes to create a bold and engaging architectural design, both inside and out. The exterior of the home immediately catches the eye, with a strong palette of white concrete, dark grey iron and wooden beams used to create a series of layered panels and levels—a form which inspired the home's nickname: The House of Overlap. Moving inside and we're greeted by a serene courtyard, with ample space for outdoor living atop an expanse of pale, cement tiles, and a simple garden included to infuse the space with a tranquil air. 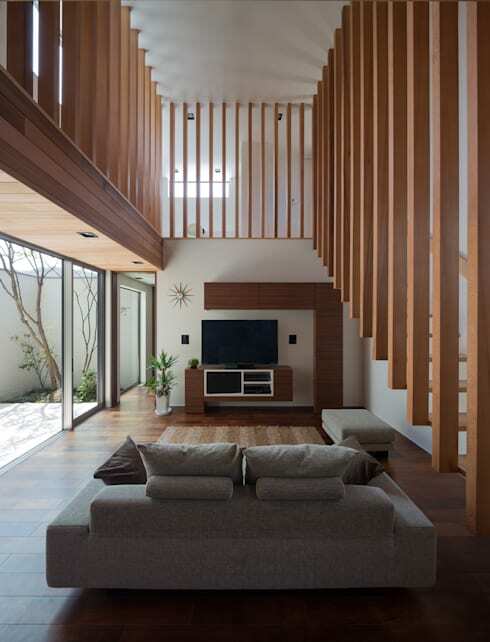 The interior decoration employs a similar modern, geometric tone to the home's facade, with the strong lines of timber used to create a range of unique design elements, from a sleek, sculptural TV, to a series of vertical slats partitioning the home's upper and lower levels. The designers of this abode certainly sought to think outside the box, creating a stylish dwelling perfect for a couple or small family. Take a tour below and get inspired! The facade of this stunning home has been constructed using a range of materials, from rendered, white concrete and micro-corrugated iron to flowing, timber panels. The result is an immediately engaging aesthetic, with contrasting textures and colours catching the eye. The home's construction also benefits from an interesting architectural design, with multiple geometric panels and structures having been placed on top of one another, an idea inspiring the abode's nickname: 'The House of Overlap'. Moving through to the home's front courtyard and we're met with a sparsely decorated space, designed to produce a serene atmosphere. Smooth, concrete tiles flow underfoot, providing a simple area for outdoor relaxation and entertaining, which is framed by the home's trifecta of concrete, iron and wooden finishes for privacy. 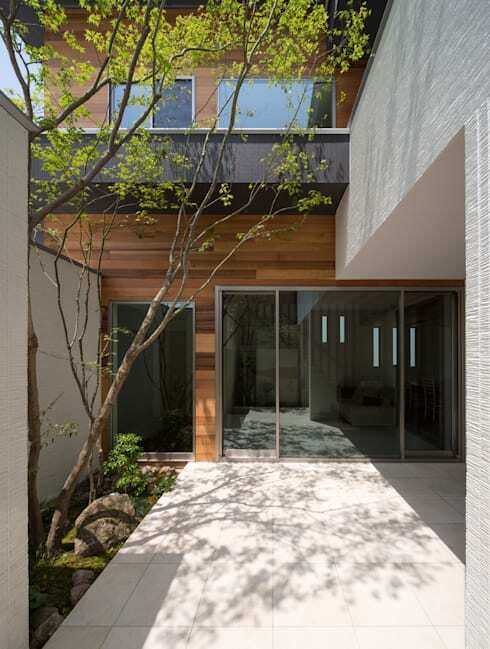 To the left, a small garden has been planted in traditional, Japanese style—a design feature that adds to the courtyard's tranquil air. 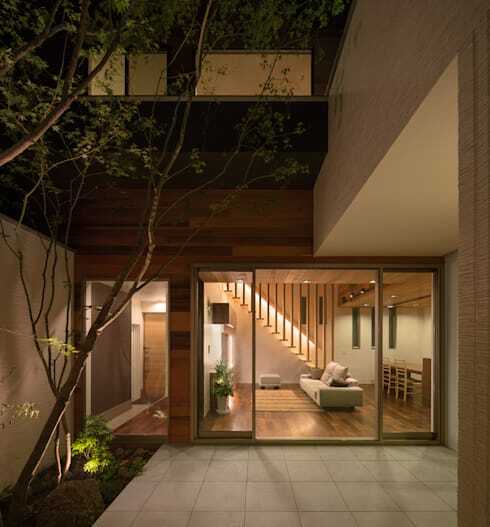 Through the courtyard's large, glass doors we find an open plan living, dining and kitchen area, each flanked in flowing timber reminiscent of the home's facade. Geometric decoration characterises the interior, with elements such as the sleek, sculptural TV unit and timber beams constructing the stairway and upper balustrades infusing this house with a unique design aesthetic. Furnishings have been kept simple and stylish, with a comfortable, grey couch adding a sense of subdued sophistication to the living room, and providing a lovely locale from which to enjoy the cool air flowing in from outside. Bordering the home's living room is this combined kitchen and dining area finished in the caramel tone of flowing, timber panels. Masterful construction lends a modern edge to the space, despite the use of a traditional design material, while the subtle lines of the woodgrain add a sense of expanse. The kitchen is stylish and compact, while the addition of a built-in dining table lays the foundation for relaxed, casual entertainment. The upper level of the home houses the bedrooms and appears open and inviting, with plenty of windows and a pale palette used to optimise the influx of natural light. 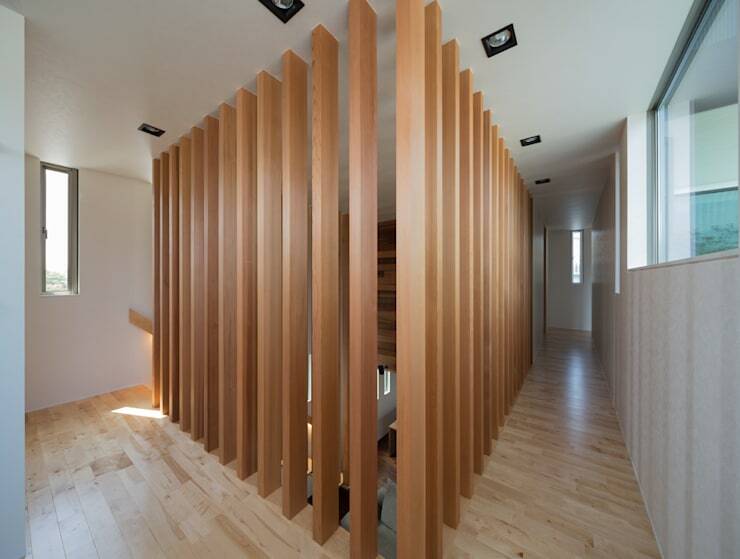 Vertical timber panels skirting the stairs and hallway partially open the space up to the lower floor, while still providing a sense of privacy and safety upstairs. Before departing this lovely home let's take one last look at its stunning, serene courtyard. After dark the space truly takes on a romantic air, with the open plan of the home's interior glowing from beyond the courtyard to beautiful effect. The entire abode appears private, tranquil and stylish, perfect for a couple or small family. 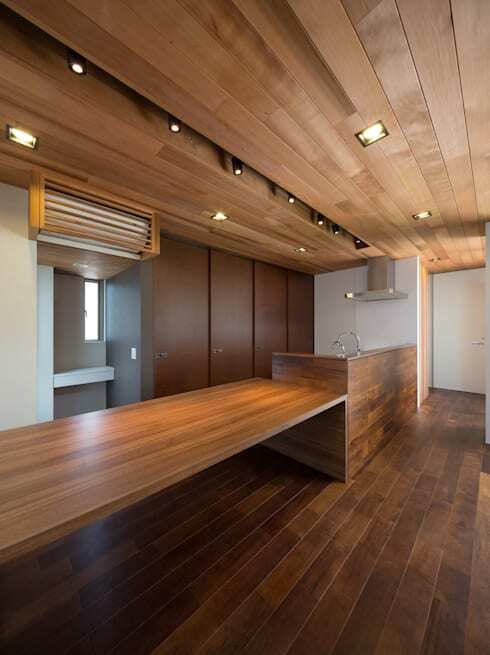 Did you like the flowing, timber interior of this abode? Then take a tour of The 3D Box House Filled with Light for more inspiration! What did you think of the strong, geometric design of this modern home? Tell us your thoughts below!